Emotions and action and flying monkeys, oh my! 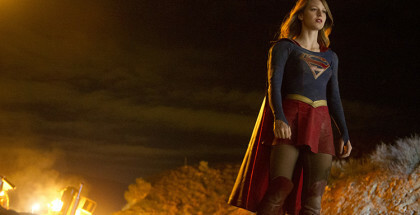 Supergirl has it all in a moving, silly, Winn-focused outing. “Flying monkeys!” Any TV episode that revolves around those two words is a win in our books. 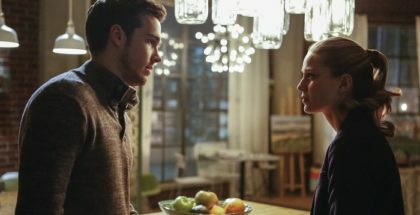 The fact that it focuses on Winn (Jeremy Jordan) – and the fact that the episode’s title is a pun (Schott Through the Heart) – is a bonus. 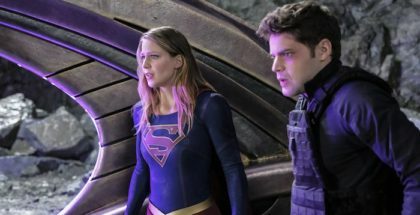 Supergirl’s strength remains its ability to develop all of its characters with compassion, without sacrificing on humour or action, and that’s perfectly demonstrated by the way that, once a year, the show wheels out a Winn-centric episode. Season 2 involved his art-heist-ing alien girlfriend, but Season 1 went down the family route, introducing his villainous father, Toyman. An evil mastermind with a penchant for clockwork, he wasn’t exactly the most memorable bad guy – but what worked was the fact that he was a bad guy to Winn, who inherited his brains, but mostly the fear that he, too, might be criminally insane. Season 3, then, brings back his father in the best way possible – by killing him off within minutes. There is, inevitably, a wind-up at the cemetery, as his coffin explodes, but the show smartly keeps the focus not on the forgettable character himself, but on the lingering impact he has upon his son. 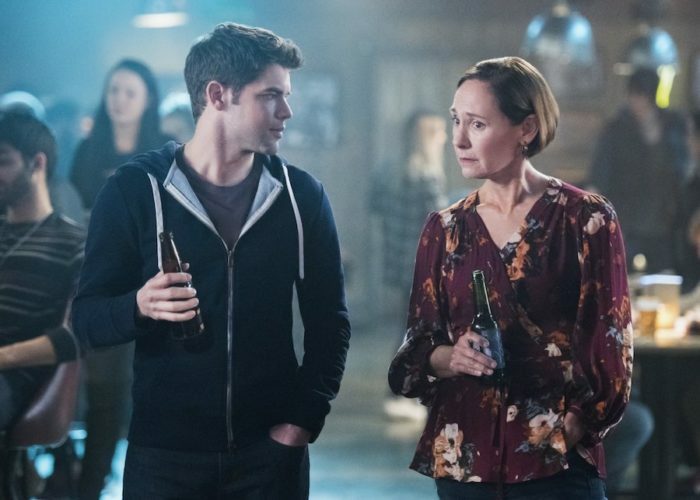 At the funeral, Winn crosses paths with his mother, Mary (Laurie Metcalf), and the pair begin to work on reconciling their years of estrangement – while he was alive, the Toyman threatened Mary with the death of their son, should she go near him. Winn’s childhood turns out, perhaps unsurprisingly, to be a dark one – DisneyLand was a euphemism for an abuse shelter – and Jeremy Jordan does brilliantly at bringing such emotional trauma to the surface without it spilling into melodrama or something jarringly too serious. That’s partly because of his light screen presence, which jumps from jokes to anger to tears with real agility – he discovers his father’s death while doing karaoke, and the rapid change in tone sits solely on his believable shoulders. But it’s also because the episode doesn’t skip on the Toyman-style antics, serving up all kinds of plastic and battery-powered machines – from flame-throwing remote control cars to, yes, robotic flying monkeys. These, we learn, are all from Toyman’s prison officer, who promised her ward that she would continue his work – again, not a hugely compelling plot point, but one that opens up more personal avenues to explore, as she contrasts strikingly with Winn’s mum, who, well, doesn’t want to kill Winn with an army of weaponised action figures. Laurie Metcalf, who was superb in Lady Bird, is just as good here, selling her bond with her estranged son despite them barely getting 20 minutes on screen together. They bond over hacking flying monkeys and how dangerous his place of work is, while we get to sit back and enjoy the light-hearted peril. If you thought the monkeys were fun, wait until the climax, which sees The Guardian in action once again (used sparingly, he’s a good addition to the team) and, best of all, Mon-El using his cape to fight a giant toy dinosaur. Repeat: giant toy dinosaur. The Guardian’s presence, too, is balanced out by his boyish checking of his phone every 10 minutes to see if Lena has replied to his message – we discover that this is actually because she’s locked Sam up in a cell at Luther HQ, for what purposes we’ll soon discover next episode. 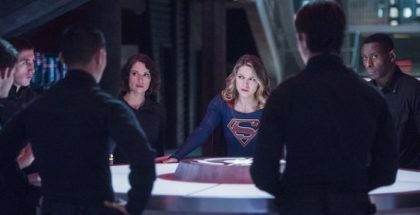 And it wouldn’t be an episode of Supergirl without some more Mon-El and Kara drama, but again, the writers mix together personal and professional: when he asks her for a drink, it’s actually to inform him that the Legion didn’t come to National City in the present day by coincidence, but because they wanted to stop the World-Killer Pestilence, who will one day grow up to become Blight, the force that wipes out life in a pretty major way in 1,000 odd years’ time. Not telling your husband that? No wonder their marriage is going through a rough patch. The result is a fast 40 minutes that juggles silliness, spectacle and sincere, heartfelt revelations with a seriously confident handling of tone and pacing. J’onn’s father, we discover, is suffering from early onset dementia, something Alex finds out before he does – and that tender, tragic moment doesn’t even come close to derailing the zippy script or distracting from the clockwork critters. Moving character drama or flying monkeys? Get you a TV series that can do both. 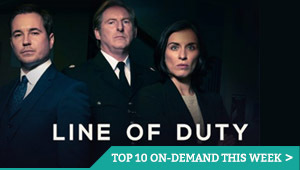 What’s coming soon to Sky and NOW TV in May 2018?